Fidelity insurance has partnered with PESABAZAAR.com, an online insurance comparison and aggregator platform to sell our insurance products online in Kenya. PESABAZAAR.com is an accredited insurance agent of Fidelity Insurance and it is licenced and regulated by the Insurance Regulatory Authority (IRA) of Kenya. It was founded in 2015 in Kenya and launched operations early in 2016. Fidelity insurance is a leading insurance company in Kenya, founded in 1940 in Mombasa; it has grown to be a recognised brand in the insurance industry, offering general insurance products for individuals, corporates, NGOs and government institutions. 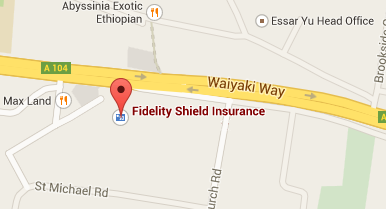 As of December 2015, Fidelity insurance had underwritten premiums of KSh 1.8 billions for the 2015 financial year. The leading business lines were motor insurance, fire and liabilities and workman’s compensation insurance. PESABAZAAR.com is an online platform that helps Kenyans compare and buy insurance products giving more convenience and transparency in the process. The public is able to read about insurance products, compare benefits, prices, different providers before making a purchasing decision. Previously, insurance customers were not given comprehensive comparison of the terms and conditions of their insurance covers, with the platform, customers can compare a wide range of individual general, medical and life insurance products to find the best cover. Customers now can take part in selecting their insurance cover as opposed to leaving it the intermediaries like brokers and agents. The platform gives online quotes for individiaul lines like motor vehicle insurance, medical insurance for families, individuals and senior citizens, home insurance, travel insurance, education policy insurance for children school fees and life insurance plans for adults an families. Life insurance plans were traditionally done by foot soldier agents in the market but they are now available online. Parents can use the platform to plan, calculate and fore cast how much they need to save for their children school fees and review all the benefits in the online quote. There is no longer need to set up multiple meetings with different life insurance agents, all this can be done online conveniently. In addition, PESABAZAAR.com has provided several simple tools to help the public understand and improve financial literacy. Tools like the KRA PAYE Calculator, Kenya Loan Calculator, BMI Calculator, daily Exchange rate calculator help the public understand simple financial planning basics when it comes to taxes, credit and healthy living.